Cozy Chicks: My secret addiction ... sssshhhh! My secret addiction ... sssshhhh! Since we’re all good friends here, I’ll ‘fess up about my latest addiction. Just last week I realized that I’d developed a strange yet mildly compulsive behavior. Of course, you have probably guessed that it’s baking cookies and brownies after nine in the evening, a time when normal people are knitting or reading or watching TV, perhaps even all three at once. I do that too, but only after I do this! I should mention that I am not a morning person! At any rate, what is there about the dark outside and the kitchen being slightly dimmer than when normal people are baking? 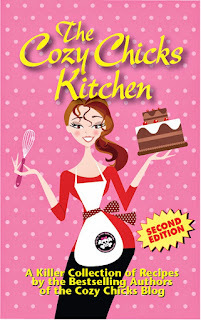 Oddly enough, I find myself surrounded by a number of food magazines and cookbooks (including the Cozy Chicks) kitchen. I’m not supposed to eat sugar and have to go easy on chocolate (how excruciatingly boring, I know) and yet, chocolate and sugar seem to play a major role in these nocturnal activities. How about you? Do you bake at odd times? Cook things you shouldn’t eat? What do you like to make? Other secrets to share? I was just thinking it's too bad you live so far away. And at this point it seems that if I didn't cook things I shouldn't eat I wouldn't cook at all. I feel the same way about you, GC! We'd be great pals if we were within a thousand miles of each other. You could have some brownies and the pugs could play. Still, it's great to be online friends. I've had to give up baking (except at Christmas) because with just Mr. L and me, it's just to tempting to overindulge. (We don't have a lot of willpower.) Most of my relatives are gone now, so there isn't anyone to bake for. (My brother is perpetually on a diet.) I will have to live vicariously through your baking binges, so keep 'em coming! My husband has a tendency to bake at night also. I feel that I would rather cook/bake in the morning that way I can munch on it in the afternoon and the kitchen can be cooler than later in the day. I am a freak during the fall with pumpkin rolls and I use to bake chocolate cheesecakes almost three times a week. I would give them to my friends most of the time. I haven't baked in quite a while, but oh boy, these items are so tempting. I seem to be most active at night. I made sugar-free brownies ( I am diabetic) at 9:00 pm last night. When I get on a baking kick I try to hold off until Saturday and take my baking to church for coffee hour. I love alone and can't afford the calories do I try not to bake too often. I would also like the recipes. I'm not a morning person and tend to to most things at the wrong time. Except vacuuming or anything in the Master. That must be done during his awake times. I'll find a way to post the recipes in a while! Stay tuned, my lovelies.